The brushed nickel finish on this contemporary table lamp is sleek and refined, creating a modern and refined style. Add this stylish brushed nickel table lamp to your decor as a contemporary accent piece. The metal tube body sits atop a tiered round base that adds heft to the slender design. Overall: 26 1/4" high. Base is 8" wide x 2" high, Shade is 13" across the top x 15" across the bottom x 9 1/2" high. Slender modern table lamp from the 360 Lighting brand. White drum shade with an uno style fitter. The description of the bronze says it comes with a cord switch. The description of the silver says it comes with a switch on the socket. Is this accurate? BEST ANSWER: Both finishes include an on/off switch located on the cord. Our website will be updated shortly. The silver one I bought came with a cord switch. Does this lamp turn on and off by touching the base? BEST ANSWER: It is white, we used these lamps in a medical office waiting area - the quality is good for the price. 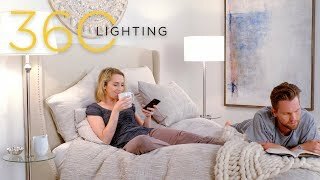 What is the size of the lamp shade? BEST ANSWER: The shade measures 13" across the top, 15" across the bottom, and 9 1/2" high. The lamp's height including the shade is 27". I have 2 of these, one on each night stand.they are wonderful. They give off a perfect bright light so you can read or work on yout laptop or tablet. After many shopping trips I finally decided to purchase my new lamp at LampsPlus where I had a large selection to choose from! ?? Love my new lamp, I’m in the midst of changing my decor to contemporary and my lamp fits in perfect, I love the silver base! Caution. In store and web site shows base about 2 1/2 tall. New one in box only has short base making it over 1 inch shorter. Also does not look as nice missing heavy base. Hello Charles R., thank you for the review! We checked the stock on this item and found that the item should come with the base as pictured. We measured the base and the design is confirmed at 8" wide and 2" high. If you believe you may have received something not accurate to the base as pictured, please reach out to our customer service team immediately so that we can assist you. Thank you!